Under New Jersey law (“The New Jersey Baseball Spectator Safety Act of 2006), a spectator of a baseball game assumes the risk of any injury to person or property resulting from any of the inherent dangers and risks of such activity and may not recover from an owner of a baseball team or an owner of a stadium where baseball is played for injury resulting from the inherent dangers and risks of observing baseball, including but not limited to, being struck by a baseball or a baseball bat. Tickets for an officially rained out game will be honored for a Somerset Patriots game later in the season. Be sure to hold all ticket stubs. The Somerset Patriots do not offer refunds for purchased tickets. There are no outside food or beverages allowed at TD Bank Ballpark. There is no tailgating allowed on TD Bank Ballpark property or any parking lot within the property. Smoking is not allowed in any part of TD Bank Ballpark. Those who wish to smoke may get a ticket stub at any gate and can smoke outside the ballpark in the designated areas. In compliance with New Jersey State law, anyone under the age of 21 will not be served alcohol. A valid identification is required to purchase alcohol. Violators of the law will be removed from TD Bank Ballpark and alerted to the appropriate authorities. No animals may be brought into the ballpark with the exception of service animals, except for specially scheduled events. All announcement requests at TD Bank Ballpark must be made at Customer Service, located behind the Press Box. A TD Bank ATM machine is located on the main concourse near the Patriots Gift Shop. Fans who encounter car troubles while visiting TD Bank Ballpark may receive assistance from Somerset Hills Towing. If your car won't star or you need some help, lift the hood of your car or contact a Patriots representative. The Somerset Patriots reserve the right to search bags entering the ballpark. Fans are not permitted to permanently attach or hang banners or fliers anywhere in the ballpark. The Patriots have barrier free spaces on both the upper and lower seating areas, each with a seat for a companion. A ramp is located near the picnic area to take fans to the Field Box level. TD Bank Ballpark has reserved parking spaces in the Red and White parking lots. Proper identification is required to use these spaces. Cameras and video equipment are permitted. Video cameras may not be used to reproduce the game. Photographers may not interfere with other guests to obtain pictures. TD Bank Ballpark's concessions are located all along the concourse, with main concession areas located behind first and third base and satellite concessions located throughout the concourse. The Patriots reserve the right to eject any person whose behavior is considered unruly or found illegal. Game tickets will be collected without refund and the individual will be escorted from the ballpark. Ejected guests trying to re-enter the ballpark will be arrested for trespassing. First Aid is located on the concourse down the third base line. The First Aid Station is staffed by certified personnel from Somerset County squads. Fans may keep any foul ball that is hit or thrown into the stands. However, any ball or bat thrown can be potentially dangerous Please Stay Alert At All Times. On game days, TD Bank Ballpark will open all gates to the public one-hour before game time. Lost and Found items can be taken to and retrieved from Customer Service, located behind the Press Box. Children and parents who have become separated should be escorted to Customer Service. A public address announcement will be made and the Patriots staff will assist in anyway possible. The public address system at TD Bank Ballpark can be used for paging in extreme cases only. In this event, please contact a Patriots representative at Customer Service. 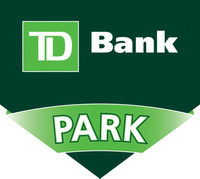 TD Bank Ballpark provides approximately 2,000 individual parking spaces. Parking for all events is $2.00 for cars and $5.00 for buses, RV's, and other oversized vehicles. Parking is prohibited in the Bridgewater Promenade lot. Violators will be towed at the owner's expense. NJ Transit train schedules for the Raritan Valley Line are available at Customer Service, located behind the Press Box. Restrooms are located on the main concourse behind Sections 203 and 204, as well as the suite level. In addition, two family bathrooms are located on the main concourse. All of the restrooms are wheelchair accessible. In the event of a security problem, please notify a uniformed police officer, a Patriots representative, or report to Customer Service.